Okay, I’ll admit it. As you know, we do a dessert spread every night and there are nights I just can’t think of something …shall we say “exciting” to bake. I did just have one of those nights and pulled out the old Magnolia Bakery Cookbook. (We had been in NYC to watch the Cornell University Men’s Hockey team play in a Thanksgiving game and just happened….yes, just HAPPENED….to be in a hotel across the street from The Magnolia Bakery). These bars (known as Shelly’s Cherry Squares) were very easy and I have to say that they are becoming a staple. The dough is just wonderful. The story is that the recipe comes from Shelly Sinko who was a baker at the heavenly place (Magnolia) and is based on a cookie that her mother made while whe was growing up. They sure are good. And with the dough, my mind started to think of all the other possibilities. Hope that you enjoy these! Grease and lightly flour a 9 x 13-inch baking pan. In a large bowl, (and I used the Kitchen Aid mixer), cream the butter with the sugar until smooth, about 2 minutes. Add the eggs, one at a time beating well after each addition. Add the vanilla. Add the flour and mix thoroughly. Spread the dough evenly in the prepared pan. With a small, sharp knife, score into 24, 2-inch squares. 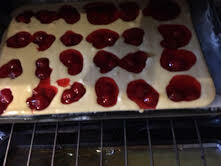 Place a teaspoon of cherry pie filling—each containing one cherry—(here I did get a little heavy handed since I really like cherries) on each scored square. Bake for 30-35 minutes or until a cake tester in the center comes out clean. Allow to cool to room temperature and then sprinkle generously with confectioners’ sugar before cutting and serving. This entry was posted in Desserts, Fruit, Holiday Recipes, The William Henry Miller Inn by admin. Bookmark the permalink.